Back in October, Harpers Bazaar shared a bunch of 70s style icons and there was a photo of Farrah Fawcett (below) in wide-leg denim with an oversized blazer and color coordinated button down. Immediately I thought of this vintage blazer I got a couple years ago and had to recreate the look! I even left my shirt unbuttoned an extra button! It looks as though she had one more button un-done, but I'm not that brave. NET-A-PORTER: Now up to 70% off in sale! I really love this (and I'm usually not a fan of a wide-legged/bell bottomed jean). You look so chic! lovely 70s outfit indeed!! you could have gone one button further, standing on a side (not a frontal) picture it wouldn't have made you feel that exposed! Love your take on this 70s look! That blazer is perfect. You have taken this look and made it fit right into now. Love the blazer and the jeans! So classy! I really like that blazer-- such a great throwback piece!! I love your coat! I am a huge fan of 70's style, I would love Rachel Zoe's closet! I love the cut and color of the blazer, great inspirational photo too. This is SO chic! I love the mix of this blazer, and cute blouse. The colors go so well together to create a very polished look! You recreated the inspiration pic flawlessly! I was just thinking that I needed to go for a pair of bellbottoms soon! I will never get over how ridiculously tall you look in those jeans, but they are amazing. And I think Farrah might have an extra button or two, but you look just as fab. 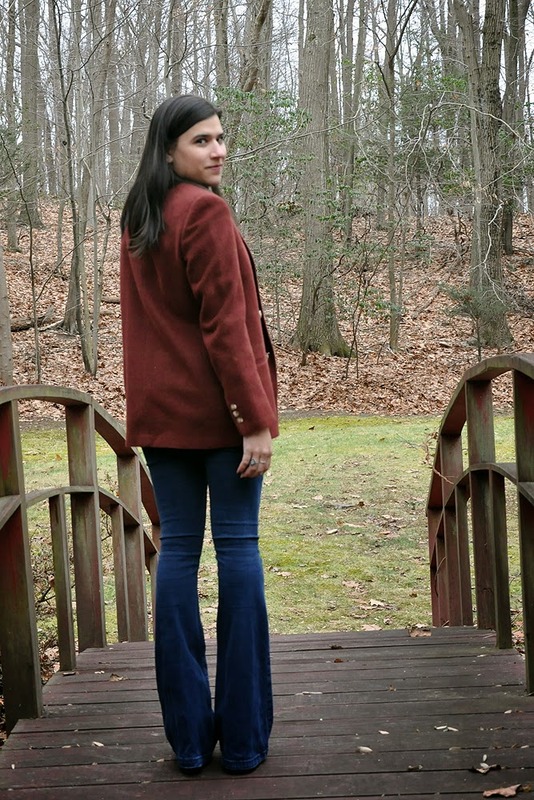 I've been obsessing over bellbottoms again! Just like I did when they happened in 7th grade...I'm searching for the perfect pair. That photo of Farrah was a great inspiration, and you look GREAT!! I love the color of that blazer.